This is a private tour with a taxi and a guide. With a local driver and a licensed tour guide, your travel experience in Hakone area will be a breeze! At 8am, your taxi will come to pick you up from your hotel and head to Hakone by taxi via the Tomei Expressway. Your first 10 minute stop will be the Otome Pass where you can enjoy breathtaking views of Mt Fuji from 1,105 meters above sea level. Then you will stop for about 60 minutes at the Hakone-jinja, a Shinto shrine that has a long history. In 757, during the Nara Period (the first year of the Tenpyo-hoji Era), the holy priest Mangan received a divine message from the deity Hakone no Okami and afterward enshrined three great deities at the current shrine's site. During Sakanoue no Tamuramaro's eastern expedition, he made a visit to pray at the shrine, and upon the answering of his prayers Hakone-jinja Shrine received the faith and support of the shogun. From the medieval period onward, the shrine received the veneration of various shogun as a central place to pray in the Kanto region. After the shrine, you'll have the chance to go for a cruise on Lake Ashinoko, from Motohakone to Togendai on the Hakone Pirate Ship Cruise for about 30 minutes. This crater lake along the southwest wall of the caldera of Mt Hakone was formed by a powerful volcanic eruption nearly 3,000 years ago, and provides postcard views of Mt Fuji towering 30 km northwest. 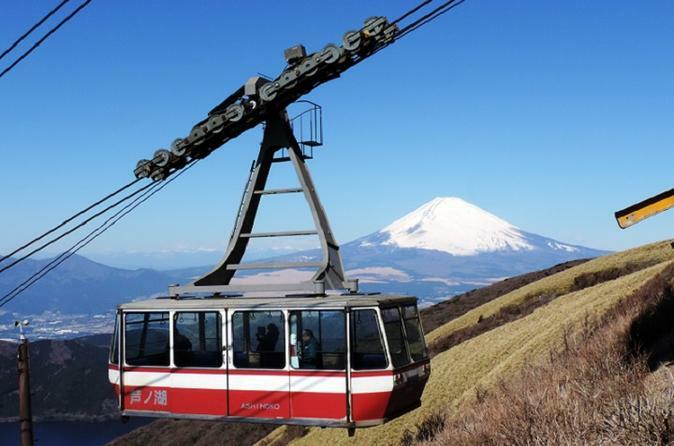 Spend a total of 60 minutes at the Komagatake ropeway including a 7-minute ropeway ride up to the spiritual Hakone Shrine Mototsumiya (original shrine) that nestles at the mountaintop. The Hakone Glass Forest Venetian Glass Museum which exhibits Venetian glass from the 15th through 19th centuries as well as contemporary Venetian glass works. Genuine canzones are performed live at the attached cafe that faces out into a garden designed to resemble medieval Venice, and hands-on glasswork can be experienced at the workshop. Later, enjoy strolling at the Hakone Yumoto Shopping Center. Hakone Yumoto is a main gateway to the Hakone Onsen District. Yumoto Onsen, the oldest in the district, sprang up at the confluence of the Sukumo River and the Hayakawa River, the outlet of Lake Ashinoko. Well-appointed inns are located in quiet settings along the picturesque gorge. After your long day touring different shrines and attractions, you will depart the Hakone Area and return to your hotel in Tokyo by taxi by 7 to 8pm.